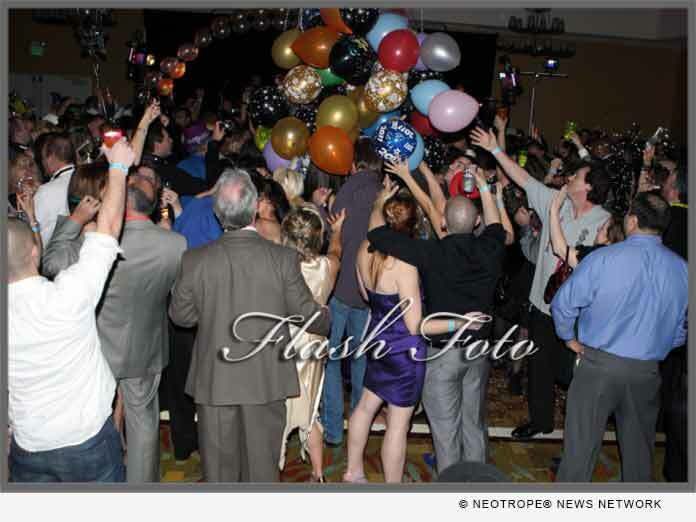 SANTA CLARA, Calif. /California Newswire/ — Professionals Guild announced today its New Year’s Eve Party at the Hyatt Regency Santa Clara in Silicon Valley as well as one at the San Ramon Marriott Hotel. The New Year’s Eve party date is Dec. 31, 2017 and hours are 8:30 p.m. to 1 a.m. Jan. 1, 2018. New Year’s Eve party guests can enjoy two huge ballrooms: one for a live band, the other for DJ dancing. Also included are party favors, optional reserved seating, two complimentary drinks, casino gaming for prizes, a big balloon drop, a champagne toast, and a professional photographer. At the Hyatt Regency, guests may purchase a variety of food in the lobby. At both locations formal dinner reservations are available. Discounted General Admission tickets and VIP tickets for these South and East Bay New Year’s Eve Parties are available via https://www.pguild.com/. Professionals Guild New Year’s Eve parties have sold out for many years and Marz Vodka is sponsoring the party at Hyatt and offering special prizes. A huge crowd is expected at both locations. To get tickets one may visit www.pguild.com or call 800-838-3006 and ask for the Professionals Guild Year’s Eve Party. Optionally, those booking a room at the Hyatt may purchase a discounted New Year’s Eve General Admission ticket bundled with a discounted deluxe Hyatt Regency hotel room and breakfast for two. This South Bay New Year’s Eve party features the FastTimes live band in one huge ballroom and DJ, Mike Westerman, in another big ballroom. At the East Bay New Year’s party, The Groove Doctors will perform in a huge ballroom, while Nick’s Music By The Bay offers unique music video dancing on 4 huge screens. Professionals from all kinds go to this New Year’s Eve party. “It’s a wonderful blend of adults of all ages,” said Phil Seyer, Director of Professionals Guild. For breakfast and room reservations, it is best to visit https://www.pguild.com/ for a link to make hotel reservations. One may learn more by calling Professionals Guild at 925-888-4392. People who purchase tickets before December 27, 2017 may invite their friends on Facebook via www.PGuild.com and get an extra special discounted General Admission Ticket.